Lecture hall. NCCA. Moscow. Photograph: Alexis Zimberg. 2013. Congratulations! 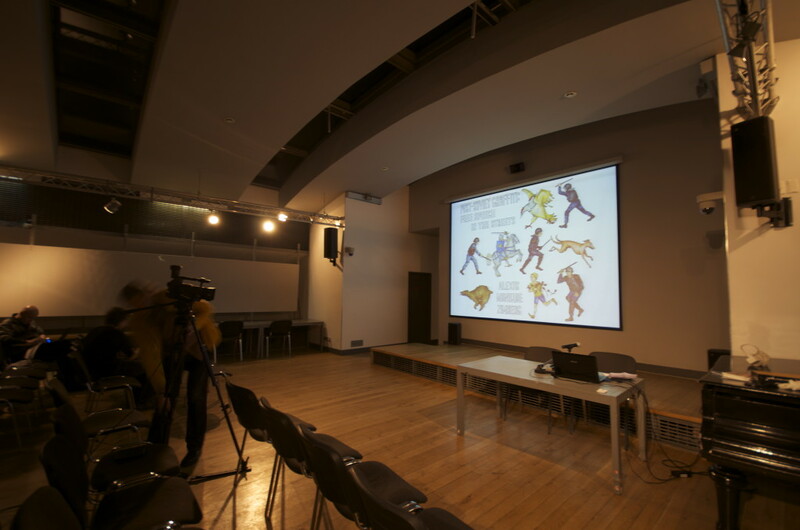 You have been accepted as a scholar-in-residence/ writer-in-residence at the National Centre for Contemporary Art (Государственный Центр Соверменного Искусства) in Moscow. Below is some information about the program from the perspective of a fellow resident. As a resident in Moscow, I work on a number of my own creative projects (a feature for a peer-reviewed journal, a curriculum-design project for the Detroit Opera House, an investigation of Jewish Moscow for the London-based Calvert Journal). Most of all, I spend my time working on the preparation of my forthcoming book, titled “Post-Soviet Graffiti: Free Speech in the Streets.” It is a real privilege and honor to work from the National Centre for Contemporary Art and with the centre’s staff (Zina, Nica, Irina, Olga) in the Petrovka District of Moscow. 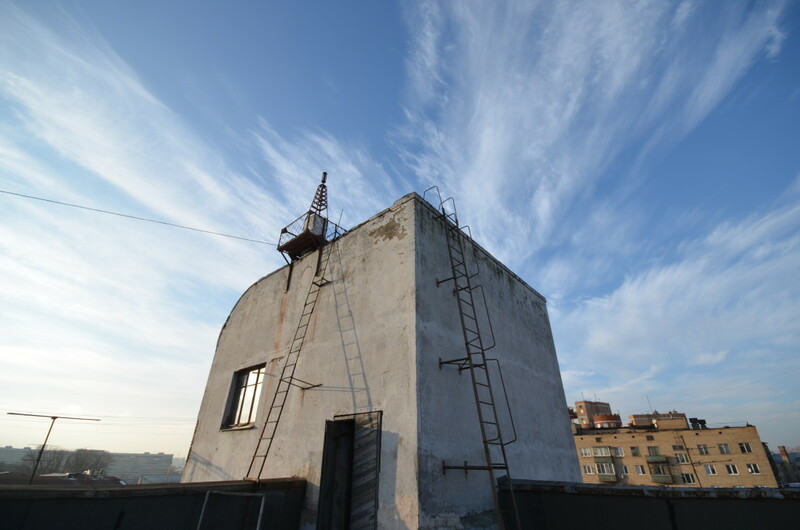 Rooftop of the House of Artists. Moscow. Photograph: Alexis Zimberg. 2013. The National Centre for Contemporary Art (hereafter referred to as the NCCA) has offices throughout Russia, from Kronstadt to Ekaterinburg. 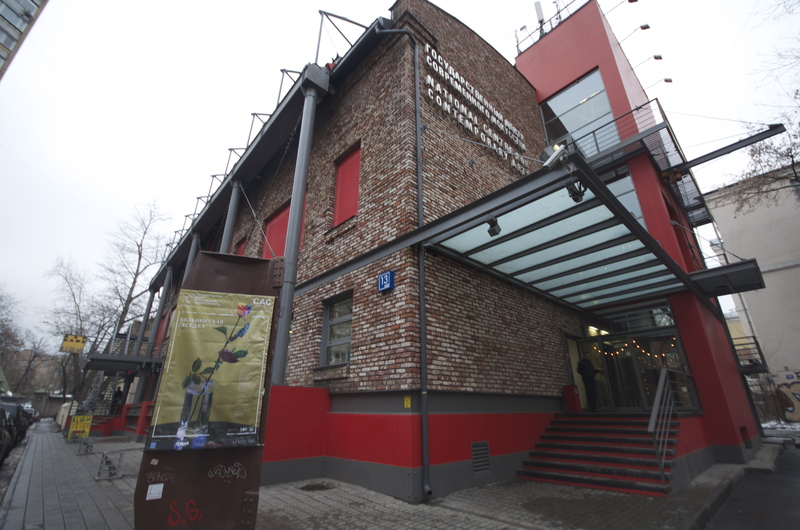 It is a research centre/ gallery/ exhibition hall that focuses on the contemporary arts of Russia, including studies of music, architecture, and design created by Russians at home and abroad. The NCCA operates under the auspices of the Ministry of Culture of the Russian Federation and the Federal Agency for Culture and Cinematography, which means that my visa lists the Russian government as my inviting party. The NCCA building from the outside. Moscow. Photograph: Alexis Zimberg. 2013. The building currently consists of an office area for about 15 workers, a mediatheque (where I primarily do my work), a large exhibition hall, a smaller exhibition hall, a gallery, a bookstore, a free coat check, a nice cafe with delicious and affordable food, and some other spaces (basements, fire escapes, entryways). 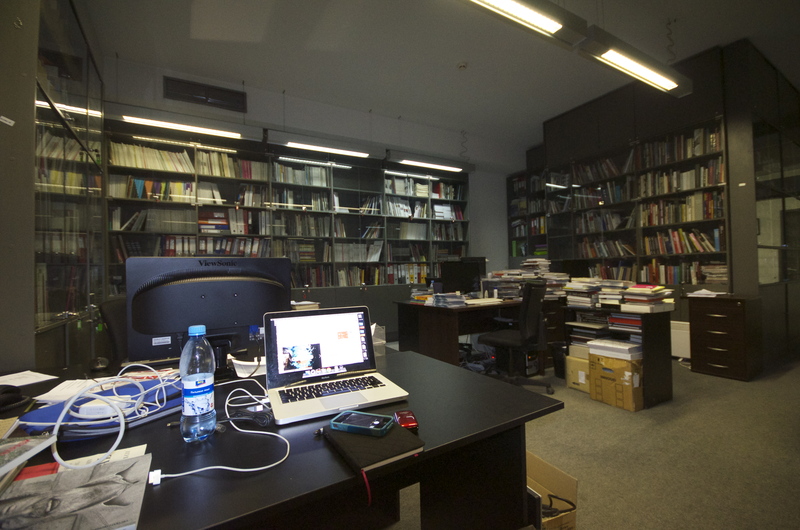 The mediatheque is floor-to-ceiling filled with art catalogues, magazines, and textbooks from around the globe, all available for your perusal. The NCCA Mediatheque. Moscow. Photograph: Alexis Zimberg. 2013. The office is lively, young, and almost entirely female. At NCCA, it seems like the staff is simultaneously expecting you and surprised that you are there. They will arrange anything that you need, from contact information to securing private films. They were absolutely wonderful to work with. You get reimbursed for everything, from Metro rides to coffees shared with interviewees. They will give you a cell phone and a SIM card (dial +7 or 8 before the number to make calls and send texts to fellow city-dwellers). In addition to giving a public lecture or event, they expect a written document for their donors that outlines the accomplishments of your residency. The lecture can be at NCCA, but this is not required. For example, a colleague gave his lecture at Moscow State University. For the hour/ hour-and-a-half lecture, you will be provided with a translator. I gave my presentation at NCCA, where we conducted the translation simultaneously through earpieces. The lecture is video-recorded and saved for posterity in the centre’s archives. 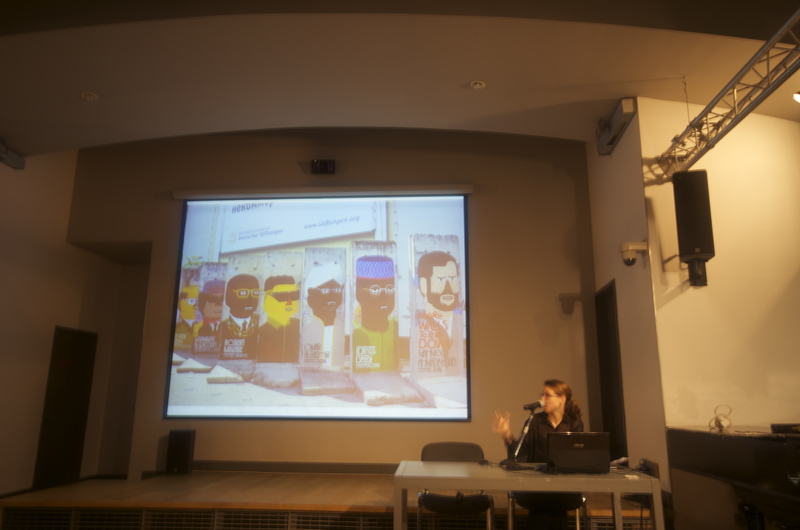 Alexis Zimberg gives a lecture on Post-Soviet Graffiti at NCCA. Photograph: Rebecca Johnston. December 2013. After 12pm when the centre opens each day, the entire space is bustling with life until about 11pm or later. And its closed on the weekends, which really means closed. As an American and a former Washingtonian, these hours are very late and unusual to me. As a result, I spend a lot of time outside of the centre. When I’m not out doing interviews or working at the main office, I head over to one of my favorite quiet/ creative/ stay-all-day cafes to write. 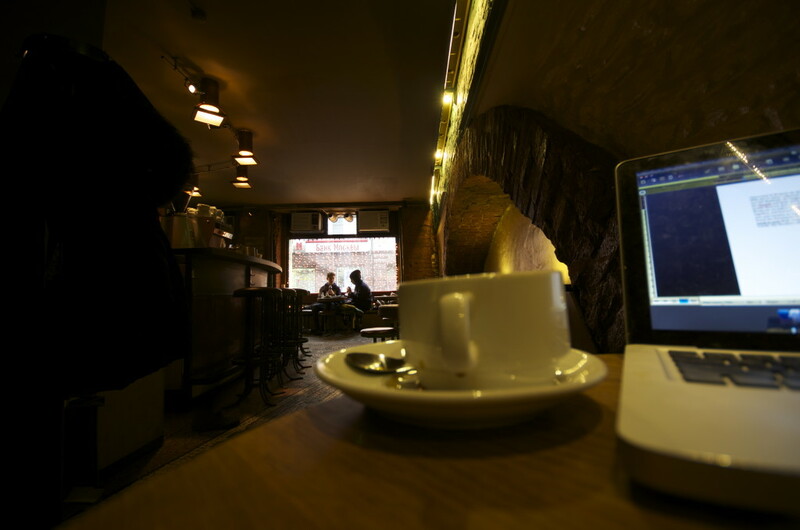 My best places to write in Moscow shortlist? Люди Как Люди, Хитрые Люди, Циферблат, the upstairs library at the Jewish Museum and Tolerance Centre, Friends Forever near Patriarchi Ponds, and the NCCA cafe. Every art gallery from Strelka to Art Play and from Winzavod to Flacon has its own cafe as well. These are largely hit-or-miss, depending on the time of day. Earlier is generally quieter. Lyudi Kak Lyudi. Moscow. Photograph: Alexis Zimberg. 2013. The neighborhood around the NCCA is lovely–filled with baby carriages, good Caucasus restaurants, and clean parks. It is not very touristy when compared to other districts of Moscow like Tverskaya, the Arbat, or the area around the Tretiakov Gallery, which is kind of a relief. I imagine that there are a lot of embassy and consulate workers that live in my neighborhood. I walked a lot and found Petrovka to be comfortable and quiet. A friend in Montreal once told me to judge a city by how the city’s women present themselves, whether they walk alone, how they dress, and so on. In this neighborhood of Moscow, it appears that women are empowered to be independent as they walk alone late into the night with confidence. All this said, the NCCA will soon move into a custom-designed building in a former airfield north of the city centre. 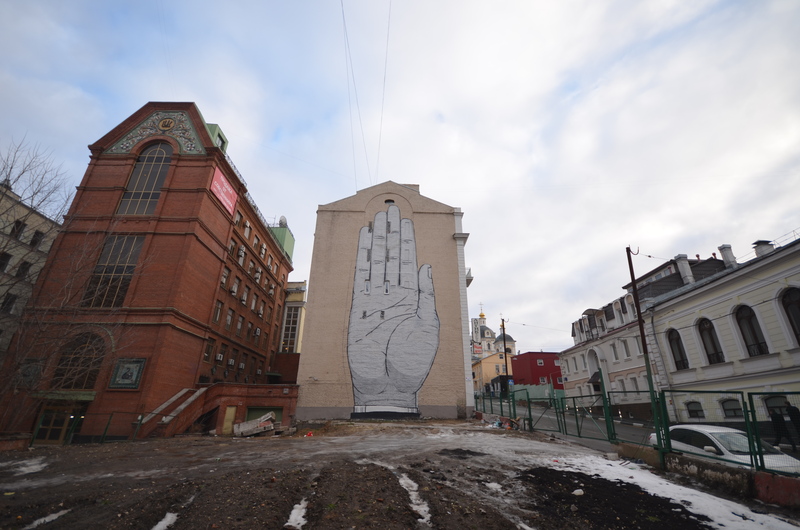 Escif’s “Heil.” Moscow. Photograph: Alexis Zimberg. 2013. 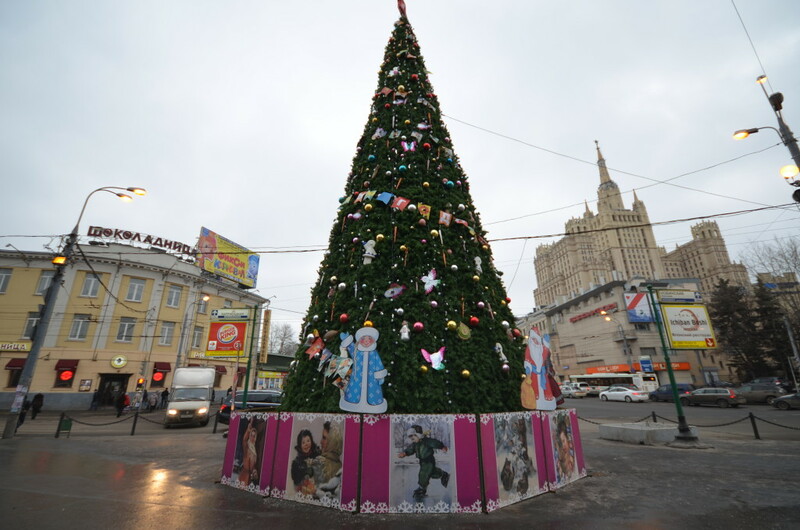 It seems to me that Moscow has experienced a cultural shift in the last five years. Aesthetically at least, if not philosophically. Young adults are dressed in plaid or black leather, in multicolored skateboard shoes or in pointed black dress shoes. Young women have short, punky haircuts and men wear their hair long and shaggy. (Though don’t worry, fur coats are still very in.) I honestly did not recognize this as the Russia that I first met in 2009, which was all makeup and heels. It took my first week back to just become reacquainted with the city again (and I was just here in 2012). 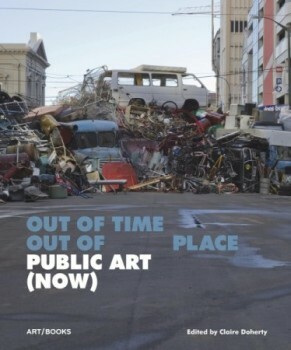 The contemporary art scene in Russia is both thriving and strictly censored by the state and I imagine you might encounter this delicate balance during your own residency. Mayor’s Christmas Tree. Barrikadnaya Metro. Moscow. Photograph: Alexis Zimberg. 2013.